Survivor, written by Chuck Palahniuk, follows the story of Tender Branson who is, or rather was, a member of the Creedish Church–a Jonestown drink-the-kool-aid-type death cult. Palahniuk, better known for his award-winning debut cult classic Fight Club, utilizes the same sort of stream of consciousness prose in developing this story line. Personally, I found this to be a better read than Fight Club, and while I’d love to write an entire post comparing the two novels, I can’t, because unfortunately I cannot talk about Fight Club (insert sly wink here). So, let’s talk Survivor shall we? Survivor is a dark and satirical comedy that unfolds in a rather unique Tarantino-like fashion. In other words, it takes the reader a little more time than usual to figure out what the hell is going on. But in a good and entertaining way, of course. As one can always expect of Palahniuk, the story immediately opens with a dramatic scene and narrative by Tender himself. Having just hijacked and taken over the cockpit of Flight 2039, Tender recounts his life story as a Creedish cult member and survivor through the plane’s little black recording box. 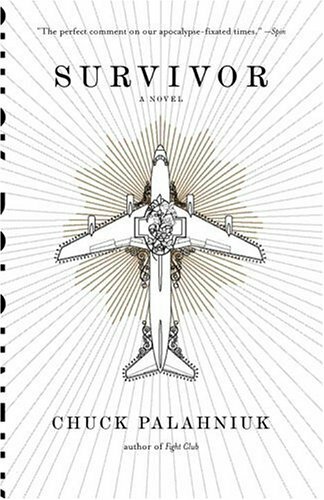 Before he begins, he explains that he is not a bad person, that he is not a murderer, that he let all of the plane’s passengers go, that the pilot had already parachuted his way to safety, and that he has approximately four engine’s time before they all flame out and Flight 2039 nosedives to smithereens. 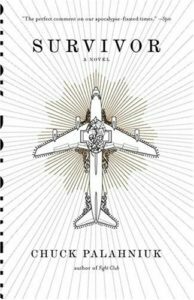 Without giving away any spoilers, the condensed version of Tender’s cockpit narrative begins with his life as a Creedish church survivor. He is deemed a “survivor” because ten years prior, the Creedish church had informed its members that Deliverance Day had come, and that it was time for all members of the church to give their lives up in order to reach Heaven, just as they were all brainwashed to do. The FBI had launched an investigation as the mass suicides began to take place and kept track of all the remaining members in hopes of saving them. Despite these efforts, ten years is all it takes before Tender is deemed the only remaining member of the now-infamous Creedish cult, and through this avenue, he becomes a national sensation. At the heart of it, Survivor is a raw critique on the nature of fame in America and the American dream. In a blatant and explicit manner, Tender details his transformation from a nobody to a religious celebrity, and the illusions behind it all. The moment he became a celebrity, Tender explains, he became a product–a live good. He was told what to eat, what to say, and what to do every second of his celebrity life. His life of “fame and glory” juxtaposed with his previous life as a Creedish cult member, at the core, really show no differences for in both scenarios he is manipulated and controlled down to each millisecond. Palahniuk, in my opinion, does a fantastic job of emphasizing this point of criticism. Through Tender’s narrative, it is evident that the more he becomes a national icon, the more he becomes removed from himself–the true Tender Branson. Pumped full of steroids, amphetamines, diuretics, and other drugs that are undoubtedly prevalent in today’s popular culture, Tender shapes up, gets good looking, gets noticed, and becomes the next Oprah of America (and I mean no disrespect to Oprah) in the sense that he gains an enormous national following. Tender, with all his recognition and acclaim, is living the American Dream. He’s got it all, right? Or so it seems. Outwardly, he appears confident, suave, and in his element. Inwardly though, his thoughts and feelings are entirely different and extremely cynical. Survivor explores this disconnect between what fame appears to be and what fame actually is. Palahniuk unveils these unfortunate truths in his usual morbid and witty prose that I find to be very enjoyable. I will warn, however, that some may find his writing to be a bit too vulgar and may find certain parts of the book offensive. If you’re familiar with Palahnuik’s writing style though, I highly recommend this thought-provoking and downright entertaining book. Confession: I thought it was better than Fight Club. Purchase your copy here! It’s on par with Brain On Fire. Palahniuk fans will love this one. I thought it was better than Fight Club. Don't tell anyone that though. It'll be our little public secret. If you've also read Survivor, leave a rating below or comment! thanks for the feedback! this was one of my older posts. i’ve definitely been working on a better text to picture ratio. I suppose for now i’ll settle for book-marking and adding ypur RSS feed to my Google account. thanks! i appreciate that! i’ll look into how to add a donation option. hi there! you can subscribe for new posts straight to your inbox by visiting the homepage and signing up via the left column. I’ve went ahead and added your email address (efren_kimble@gmail.com) to the subscription list.